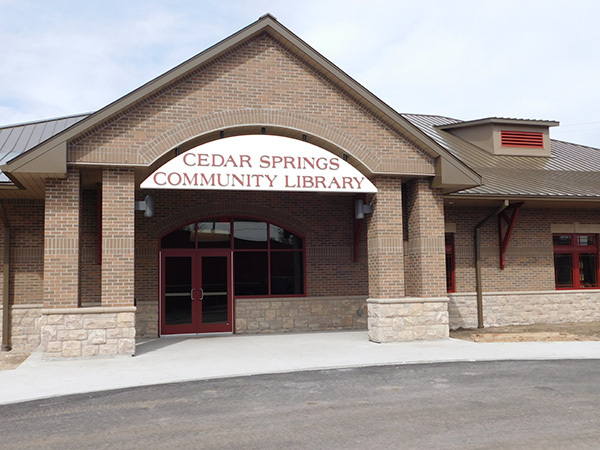 Tag Archive | "Cedar Springs Library"
The new Cedar Springs Community Library will hold its grand opening celebration on May 13. Photo by J. Reed. The Cedar Springs Library staff and community volunteers have been busy the last two weeks moving books and other things from their small building at 43 W. Cherry, into the new library at the corner of N. Main and W. Maple—a building that is almost five times the size of old one. 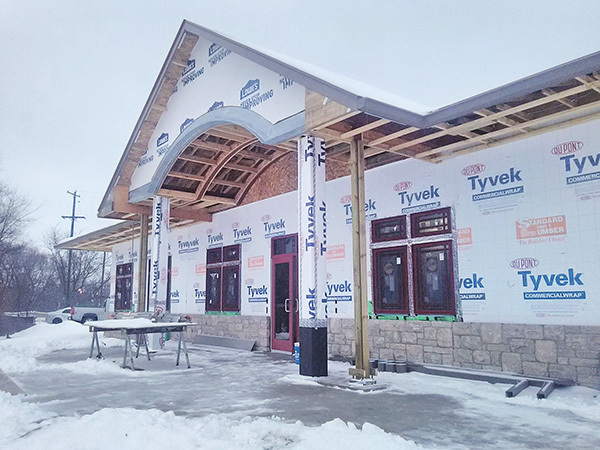 The library, which is designed to resemble a train depot, promises to be a main attraction in the heart of Cedar Springs. The new building is beautiful, spacious, modern, and comfortable. 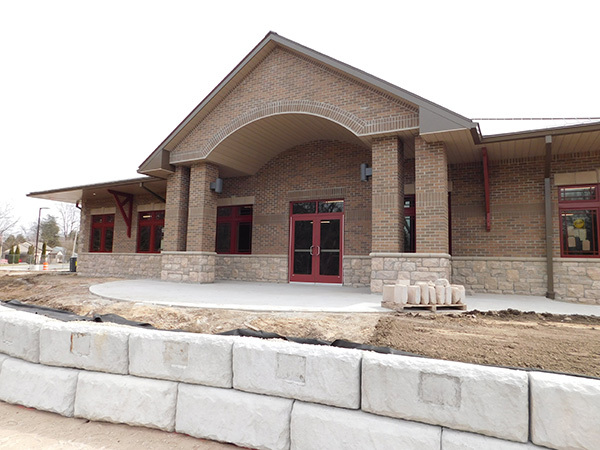 And come next week, the public is going to get to see what a gem the new Cedar Springs Community Library is. They will have a soft opening on May 8, with the grand opening and ribbon cutting on Saturday, May 13, from 2-5 p.m.
Grand Opening festivities at the 107 N. Main Street location will begin at 2:00 pm with a flag raising ceremony by the American Legion Color Guard Glen Hill Post #287, and patriotic songs by the Cedar Springs High School Band. Other events to follow include acknowledgements and ceremonial ribbon cutting. After the ceremony everyone is invited to take a tour of the new library and enjoy refreshments until 5 p.m. Stationed throughout the library will be local authors, a puppeteer, staff, local officials from the Library Board, the City of Cedar Springs, Solon Township, and the Community Building Development Team. Library staff and volunteers have been busy getting the new library ready for children, teens and adults. Courtesy photo. The new 10,016 square-foot building was built with donated funds, products, and services from the community and local businesses. The additional 8,000 square feet will allow for much greater areas for reading, special events, and small group gatherings. The new library includes separate areas for children, teens, and adults; 12 computer stations; four stations for children’s computers; a cozy reading or meeting area with fireplace and chairs; three small group rooms for tutoring or studying; and a classroom with white board and screen. Another draw will be the community room, which will hold up to 75 people with the tables and chairs, and 100 without. A complete kitchen opens up into the community room. People can walk out of the community room to a patio, which is facing the creek. Donations of any amount are still greatly needed to help purchase furniture, kitchen items, and other operational items for the library. 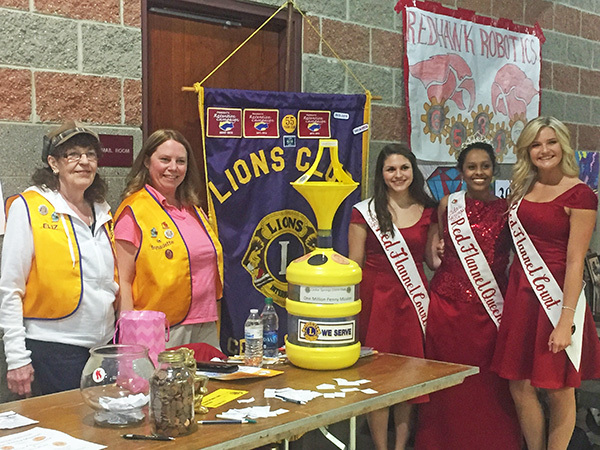 If you’d like to donate, please call the library at 616-696-1910. 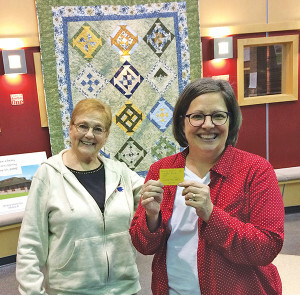 Kat Pont, right, with Louise King, left, was the winner of the quilt that was raffled off at the library fundraiser. The Friends of the Cedar Springs Library held their 5th annual quilt show fundraiser on Saturday, March 18, at Cedar Springs Middle School. 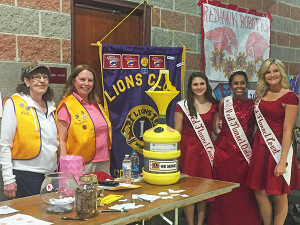 Louise King and Barb Grutter chaired the event. 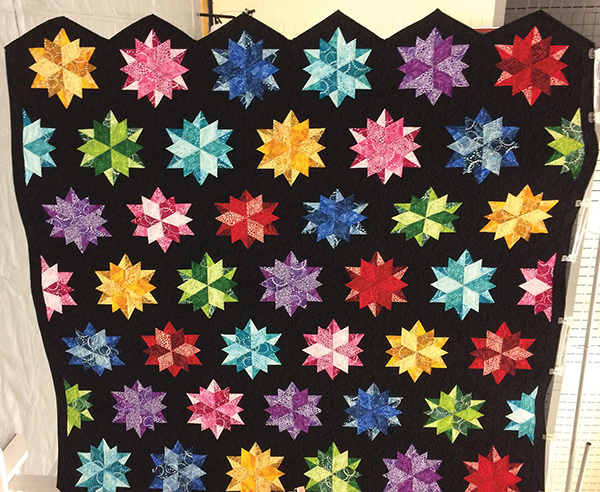 The Friends raffled off a beautiful quilt that was designed by Grutter, pieced by King, and quilted by Nancy May of Aerie Quilting. 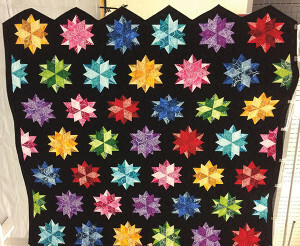 The winner of the quilt was Kat Ponte. 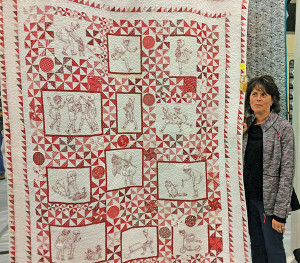 There were also awards for quilts entered at the show. Deb Gasped was the winner in the King/Queen category. 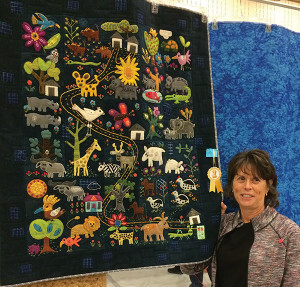 She made an 85×96 inch bed quilt named Starry Night. The winner in the Table topper/tote category was Deb Westveer with her Christmas table runner. Sherri Pipenger was winner in the Full/Twin category. Winner from the Full/Twin category was Sherri Pipenger. 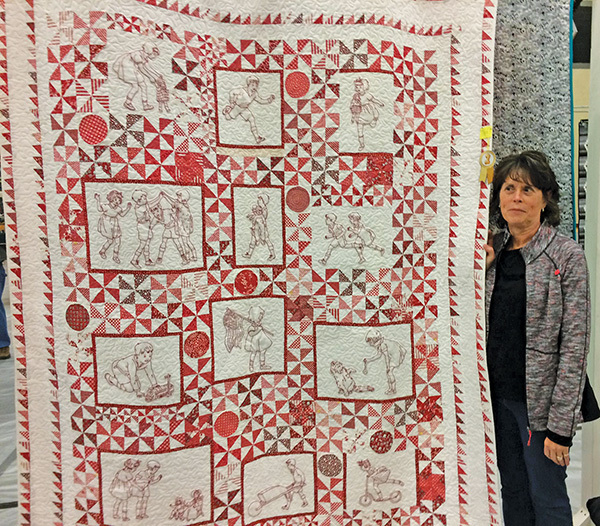 She made an embroidered red work quilt from the pattern American Jane’s Playmates. Sherri Pipenger was also winner in the crib/wall hanging category. Pipenger also won the Crib/Wall-Hanging category with a wool applique quilt. She used the Elegant Garden pattern by Edyta Sitar. 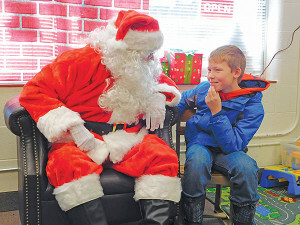 All proceeds go to fund the new Cedar Springs Library. Cedar Springs Fire barn: will it stay or will it move? 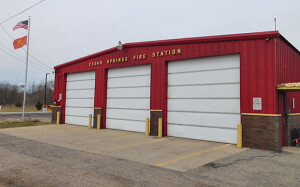 The current Cedar Springs Fire Station, at W. Maple and Second Street. Photo by J. Reed. 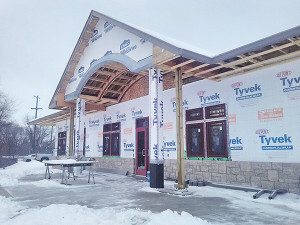 With all the talk of the opening of the new library at N. Main and W. Maple Streets, the question arises: what is happening with the Cedar Springs Fire barn? Will it stay where it is, or will it be relocated? Chances are, it will be relocated close to the very same area it started in. According to The Cedar Springs Story, by Sue Harrison and Donna DeJonge, a new fire station was built at the corner of Cherry and Second Street in 1874. When the book was published in 1976, the Fire Department also had a station at that same location, 43 W. Cherry. It later became the home of the current Cedar Springs Library. According to Fire Chief Marty Fraser, they shared the building for a time with the Cedar Springs Library. The Fire Station had the west part of the building, and the library had the east side. Then a new fire station was built on W. Maple in the late 70s or early 80s. That’s where the fire department is today. Come May, when the new library opens at Main and W. Maple, the fire department and library will once again be sharing the same property, although not the same building. That is, until a new fire station is built. The new location would be just behind the old library, in the area where the Cedar Springs Community building used to stand. Womack said that another idea was to share a building complex with the county, on property they own on 17 Mile, behind Taco Bell, but the timing wasn’t right. “That project is 3-5 years in the future and we want to break ground in the next 1-2 years,” he explained. Stay tuned! The Post will pass along more info on the building of the new fire barn as we get it. 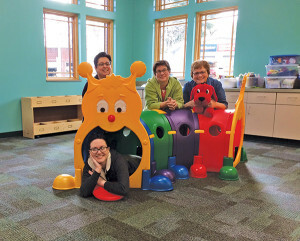 If you’ve been down Main Street in Cedar Springs recently, you can’t help but notice how far along the new library is at the corner of Main and Maple Street. 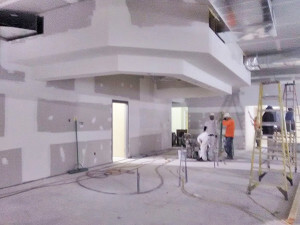 “It’s coming along really well,” said Library Director Donna Clark. “But you can’t really see what’s happening inside.” According to Clark, workers are putting up drywall, and the roofing will be done anytime. They are also working on the parking area. 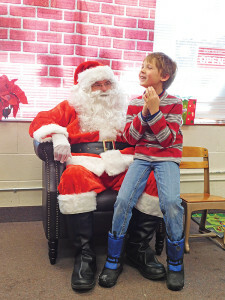 Clark also said that the Library Board voted to replace the sidewalk that will run in front of the building on Main Street. The building will be done sometime in the spring. 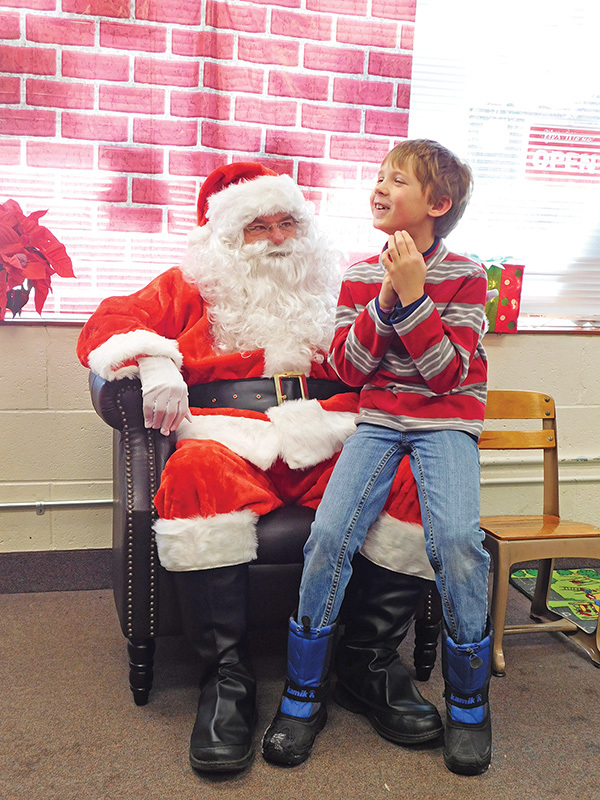 In the meantime, the library asks you to give a gift, a legacy, to the ones you love for Christmas and to help with costs for the New Cedar Springs Library, as well. For $50 you can get a 4×8 brick with 3 lines, or an 8×8 brick with 6 lines for $100, and inscribe it as you wish. Bricks will be placed at the Library entrance and a few other places, as needed. The 10×8 retaining wall blocks are $1,000, and will have a brass plaque insert with 8 lines available. Logos are also possible with a block. Blocks will be used along the path to the Cedar Creek walkway.